If you’re in a tourist area, I can provide a custom design that celebrates your region’s landmarks and uses fabrics that capture images of your area. Visiting quilters often look for patterns that represent the region they are visiting. I can design a pattern that can be sold through your shop. It can be a stand-alone pattern, or can be packaged with fabric to create a convenient kit for your visitors. I also have several patterns that are perfect for use with motif patterns and can be used with fabric you stock. The smallest is great for theme motifs (such as kitchen or botanical prints) and can be used for a wall hanging. It is also suitable for baby quilts. These simple patterns are perfect for creating kits or for beginner quilt classes. I can teach the travel themed workshops at a quilt shop. If desired a workshop design will be developed using the shop's fabric and themes from your area. 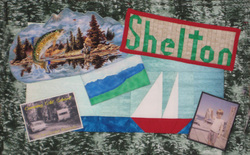 An example shown was developed for Annie's Quilt Shoppe in Shelton, Washington. Students can complete the quilt as designed, or use it as a basis and incorporate their own elements.